Happy New Year to all our friends and faithful clients! I know I waited a few days to give thanks for a wonderful 2011 and to wish everyone a great 2012, but things have been a little crazy and as you know by now, I’m not the best social media person. But I’m working on that. New Year resolution stuff, that will hopefully last at least a few months… ha-ha-ha! But thank you for giving us a great year. We’ve weathered so much in the last few years. We’ve gone through some changes (and continue to change) and we are all so totally grateful that you have been with us through the ups and downs and that you continue to hang in with us as we slowly change and morph into a different kind of place. You’ve helped us launch a punch card program this year, that we continue to try to make work for you and for us (thus the longer than normal re-order time), the new ones are coming soon and we have kept everything on record so no worries, you will get all of your punches due to you while we work on these. AND you helped us win King 5’s Best of Western Washington!! That was an awesome highlight for us, for sure. We get to see your children every few months and watch them grow and change into little humans. We watch you through pregnancy, to having babies, to watching these little ones grow to talking, walking humans with a voice! BUT, I think, looking back on 2011 the best thing that happened for us was the amazing donations that came from you all during Operation Airlift Japan! The donations filled half of our store and you all showed me why we do what we do. Why we hang in and keep the doors open. We have AMAZING customers and clients that are giving, compassionate and “family”. That was my highlight. I thought we would see a little corner of gently used stuff and people showed up with boxes of new food, clothes, underwear and toys… instead we saw our store fill half way up and people coming through the doors through the days with their donations in hand. It was truly awesome. For that sight and display of compassion, I am most grateful. So, thank you. Words can’t express how grateful we are to have you in our lives. I’m excited for the year ahead. New punch cards, new salon space for older kids and adults, parties, classes and some other special things popping up! We can’t wait to visit with you all during 2012 and see what the year not only brings us, but what it brings for you! We hope that 2012 brings you and your families all the joy, health, happiness and blessings that you deserve! 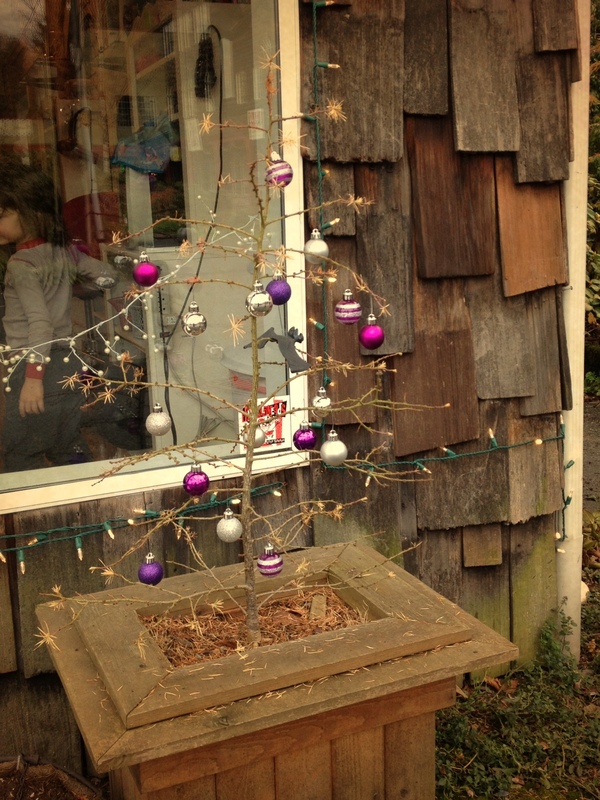 PS….. thank you Dena R. for solving the mystery of the overnight decoration of our sad little “Charlie Brown” tree! That was awesome, you crack us up! Thank you Dena! A sad tree made happy.